So until this afternoon, I was mentally trying to prepare for surgery tomorrow. But things have been changing. I have been getting progressively better since Sunday (2-3 days ago). Whereas last week I was desperately gulping down painkillers every 3-4 hours, I am now down to about two a day. HUGE difference. I am now going long periods of time without having to lie on ice packs. I am relatively comfortable in a flat position. This is all good. But I am still only able to tolerate being up (above a 45 degree angle) for about 10 or 15 minutes at a time. That means a quick shower, lie down and rest, getting dressed, lie down and rest, then another quick blowdry of my hair. Then painkillers. Still, it is way better than last week. A week ago, I was getting intravenous morphine in the ER and even at 3-4 doses, when I was almost unconscious, I still had level 6-7 pain. That was bad. It was so bad. I am so thankful to not be there anymore. The surgeon called earlier this evening and we had a good long talk. I really like this guy. He is so thoughtful, and reasonable and smart. We decided to postpone the surgery for another two weeks and then re-evaluate. He said I might just keep getting better until I am ALL better. He also said I might plateau at a certain point and when that happens, I am just going to have to see if that is at an acceptable place. For example, if I were to plateau where I am right now, this would NOT be acceptable. As comfortable and improved as I am, I am not about to live the rest of my life lying on my back. I’ve been feeling great empathy/solidarity with Frida Kahlo these days. And inspiration and awe. Especially images like this. If she can paint, I can write. I feel like I bought a little more time. To see how things go. I am feeling a lot more alert, like I can do things again. I can write. I can read and get some things done. This is going to take a lot more patience. We asked the doctor, the difference between resting-healing and surgery, in terms of pain relief. He said the surgery would give me immediate and total relief because the nerve would not be getting squeezed anymore. What about a chance of relapse if I don’t get the surgery? There’s a 30% chance of relapse (in the next year or two), just because the nerve doesn’t have as much space as it did before the disc ruptured. That sure doesn’t sound like fun. Just saying: if I DO have a relapse of this experience, I’m getting that surgery lickety split. No question. So I’m back in wait and see mode. I am feeling…. mostly good about this. I have to admit some degree of disappointment because I was getting pretty darn excited about the IMMEDIATE AND TOTAL PAIN RELIEF. But I also know there is are risks with any spinal surgery. Patience. Patience. I’m learning so much about patience. And again, letting go. I let go of the Grotto reading at LitCrawl. I let go of our grand 25th anniversary trip to San Miguel de Allende (sob!). Next up on my calendar is the Adoption Policy & Reform Collaborative Conference in Minneapolis in two weeks. I am scheduled to speak on a panel and perform. I want to do this SO BADLY. For so many big, big reasons. If I did do the surgery tomorrow, chances are I’d be recuperated enough to fully participate. But doing this the nonsurgical route, I am not so sure. It makes it much less likely. I am going to wait until the very last minute to decide. It could just be one more in a long list of letting-gos. I’m also learning so much about kindness. I’ve been astounded and overwhelmed at the level of support and encouragement coming my way. Lovely gestures of caring and friendship. Today I had three visitors. One friend brought me this fabulous ice pack contraption. 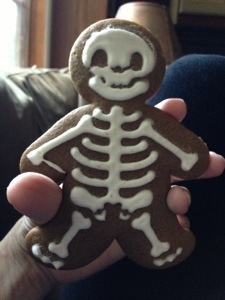 And a “happy skeleton” cookie. Another friend brought some beautiful orchids and my favorite clam chowder from Sam’s Chowder House. I’ve been feeling very, very loved and cared about. Which has been humbling and sometimes enough to make me cry. I’m mostly feeling a lot of gratitude. A LOT. To all the people who have left me sweet comments and words of support on Facebook, who have texted and sent cards and stuff to cheer me up. Who have brought food to my family, and visited me when I am able, and who have understood when I am unable. Who have listened, who have supported Mr. McB who has really been worn down to a nub by all of this. Who have filled in for me at work. Who have tracked this whole weird journey and just been so nice. Thank you.